Ian Joseph Harvey (born 10 April 1972) is an Australian cricketer. He is an all-rounder. He was named as one of the five Wisden Cricketers of the Year for 2004. Harvey started his first-class cricket career with Victoria in the Sheffield Shield in 1993 as an all-rounder. He was called up to the Australian one day cricket team in 1997 and has played 73 One Day Internationals. Harvey bowls tightly at the end of games, equipped with a well disguised slower ball, as well as being a big hitting late order batsman, however he did not hit an ODI half-century. Harvey played in the 2003 World Cup in South Africa as a replacement for the injured Shane Watson. He played in their first group game of the tournament against Pakistan. coring more than a run-a-ball 24 supporting Andrew Symonds who made a match-winning 143 not out. Defending 310, Harvey was the best bowler picking up 4 wickets including one with his first ball as Australia won comfortably. Harvey lost his place when Darren Lehmann and Michael Bevan returned from injury. He featured in one more group game against the Netherlands where he picked up three more wickets. 7 wickets in 2 group games. 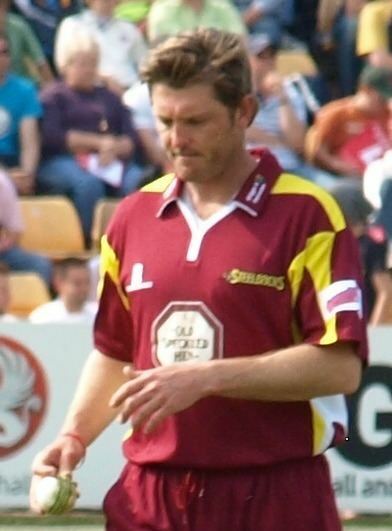 Harvey played for Gloucestershire from 1999-2003 in the English County Championship and domestic one day competitions . He was an integral part of the team that won a number of one day trophies, including four one day finals in a row. Harvey also scored the first Twenty20 cricket century in 2003, and has scored 3 T20 centuries in all. In 2004 he switched counties to play for Yorkshire for whom he played until 2005. For 2006, he returned to play for Gloucestershire in English County Championship and Victoria in the Pura Cup. He signed to play for Derbyshire in 2007, but did not play a full season as his clearance to play as an English-qualified player was not received from the Home Office. Approval was delayed as a result of a drink-driving conviction, a decision which upset Derbyshire chief executive John Sears. Derbyshire allowed Harvey to play for Middleton Cricket Club for a weekend as a temporary replacement for their professional. For the 2005/06 season, Harvey played with the South African provincial side Nashua-Western Province Boland, where he also coached and commentated, sometimes doing two or all three at once.